Earth Science Clarifying Herbal Astringent Description: Natural hyaluronic acid and nine herbal extracts - for oily/combination skin Corrects and controls "over-active" skin. 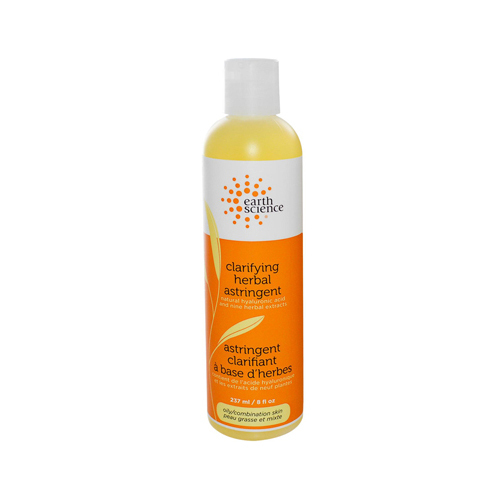 This toner provides blemish control by tightening pores and substantially reducing oil production in the skin. It also prepares the skin to be more receptive to further treatment. 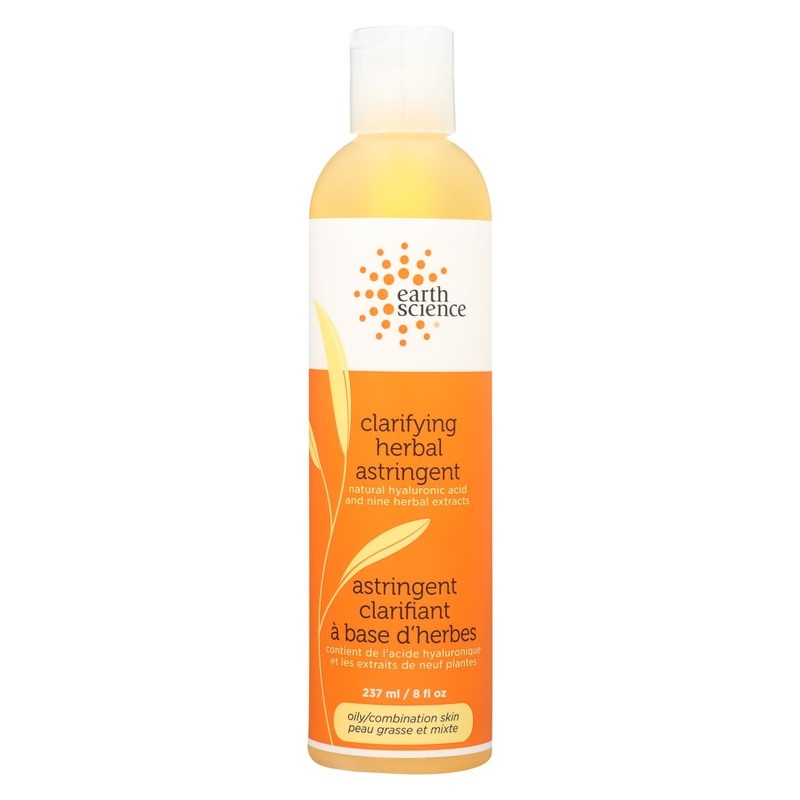 Extracts of Witch Hazel, Sage, Rosemary, Horsetail, Cucumber, Sea Kelp and Peppermint provide gentle astringency. Sulfur, Camphor and Zinc combine to help reduce oil flow. Natural Hyaluronic Acid delivers oil-free moisture. pH 4.0. Free Of Animal ingredients, methyl and propyl parabens. Disclaimer These statements have not been evaluated by the FDA. These products are not intended to diagnose, treat, cure, or prevent any disease. After cleansing with Clarifying Facial Wash, saturate a cotton ball and gently wipe face and neck, paying special attention to oily areas. 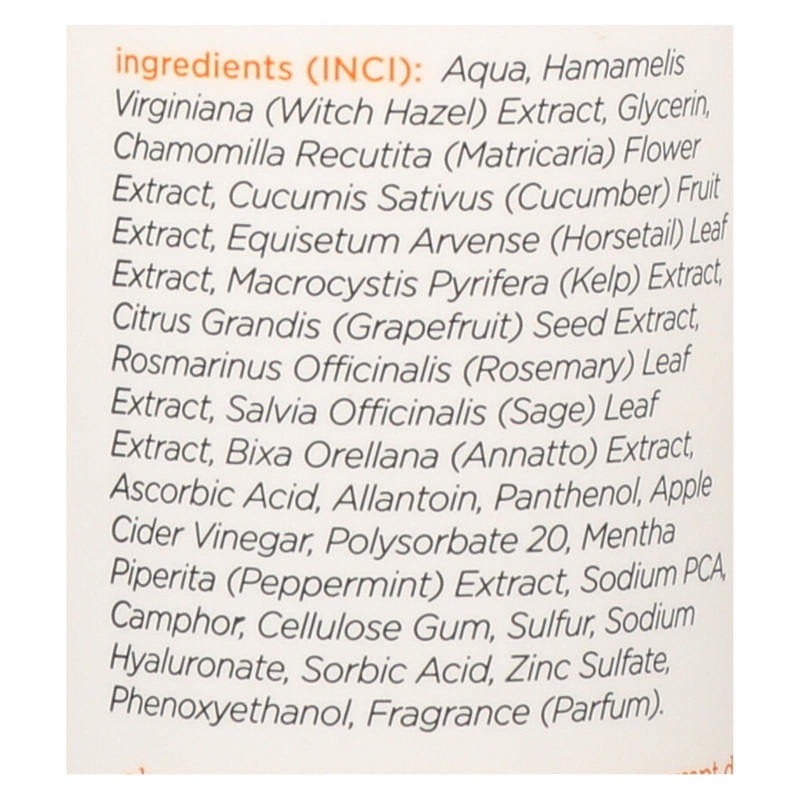 Ingredients: Purified water, witch hazel extract, glycerin (vegetable), apple cider vinegar, sage extract, rosemary extract, horsetail extract, cucumber extract, sea kelp extract, peppermint extract, panthenol, sulfur, camphor, sodium PCA, zinc sulfate, sorbic acid, grapefruit seed extract, allantoin, hyaluronic acid, ascorbic acid, fragrance, cellulose gum, annatto extract. Not tested on animals. Hypo-allergenic. Witch hazel extract, apple cider vinegar, zinc sulfate, aloe juice vegetable glycerine, panthenol, hyaluronic acid, sodium PCA, camphor, sulfur, sage, rosemary, horsetail, cucumber, sea kelp and peppermint extracts, sorbic acid, allantoin, grapefruit seed extract, ascorbic acid, fragrance. 0.85" x 0.81" x 0.64"